On July 23rd, 2011 CKUT’s Magic Sound Mountain Collective made a furtive ascent of Mount Royal and found a spot along one of the less trodden foot paths through the forest where they installed 6 hand made speakers that were used to diffuse multi channel sound compositions for the forest dwellers, invited guests and nature enthusiasts who happen upon the installation while enjoying a hike through the mountain. Taking the frequency and brightness of sound limitations imposed by the small speaker systems that was built by the Collective members, each member composed a piece for the forest. Recordings were made during the diffusion of the Magic Sound Mountain in the forest and were remixed with the sound pieces to create an over view of the Magic Mountain experience. Invisible Audio: Nature is becoming invisible and is replaced by visible disposable products. For the piece, speakers will be put in and around a fake tree placed in the middle of nature. Fabricated or Real ? Machinery or Humanity? Questioning the role of us as a community where nature is becoming a commodity in neighborhoods to suit the trends and needs of the current generation. ”are we taking a step back? forward? cycle.” This piece was created by t+l (television longplay). Tony and Liz are instruments from the magic sound box. They are sound artists mixing electro acoustics, music, spoken word and radio together. 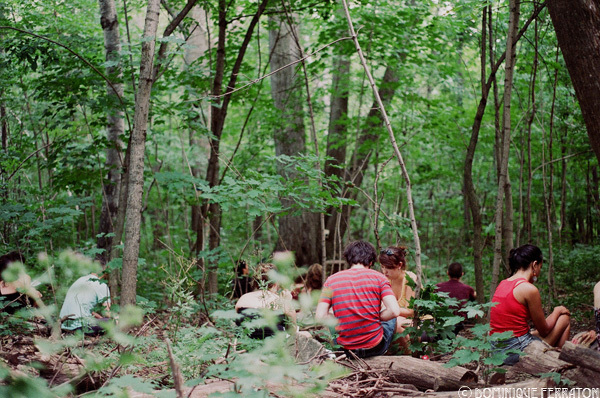 Forest Singing: The forest sings, and as it shifts from natural to digital, can you tell who is out of their element? By Nathaly Arraizdescribes herself as being between a sound artist and a sound tech; she likes to observe, interpret and create. “3 dialogues” (excerpts): This is a demonstration of some of Generic Media Group’s work in the field of nonspecific audio. Hundreds of dialogues from various films were analyzed to create a statistical model of contemporary conversations. From this model, excerpts from 6 dialogues were rendered. Generic Media Group provides services for those in need of nonspecific audio, video and text. Current projects include setting up clients with internet radio stations that offer unlimited access to guitar solos, sad music and domestic dialogues. Internal natural buzzing: Fjola Evans is a cellist and sound-arranger living in Montreal, Canada. piwiwounnnwooowoounnnng: Field recordings of native North American forest creatures mingle with foreign species. Bird song, whispers, spring peepers, Cicadas cicadas, electronic interventions, wind in the trees,and tambura. 4 channel piece, by andrea-jane cornell. Andrea-jane makes ambiances ferroviare-aquatique, clochettes-tiques, oiseau hydrophone, grenouilles grouillant with objects and field recordings. Rules of Nature: An excursion in the wilderness, a walk in the woods: what freedom, what a complete detachment from the structure of our everyday lives. But is this really how it feels? Our behaviour in these “wild” spaces is often so controlled that our actions are even more organized and limited than usual, by Dominique Ferraton. Dominique spends much of her time wandering in empty lots, knitting mittens, winding film in old cameras and creating sonic quilts made of found sounds and field recordings. Priscault Sounds: Cette piece composee et pensée par les jeunes musiciens ( de 8 a 17 ans) du Camp musical de Lanaudiere. Nous avons travaille avec leurs sons, leur musique, leurs voix et leurs histoires – leurs sons et musiques forment une de trame de base, et leurs voix, leurs histoires viennent ponctuer le tout. Emanuelle Majeau-Bettezest une pianiste originaire de la region de Lanaudiere, Charles Beaudoin est pianiste et compositeur originaire de la Montegie et Felix Schneller est un compositeur qui se dirige desormais vers la philosophie. Tous trois ont travaille avec les jeunes musiciens du Camp musical de Lanaudiere pour la composition de cette piece. Echoes from the Lincolnshire Poacher/Somewhere in the Western Desert: Two pieces in one. This piece uses field recordings, recorded instruments, recordings from The Conet Project, and a poem written by E.Y. Barnard, Lieutenant entitled there was the richness…. The poem was taken from Poems from the desert (1944), a collection of poems written by fighting men in the Eighth Army. The poem was translated and recited by Jacinthe Dupuis(French), Ali Gorji (Arabic, not included in final edit), and recited in English by Neil Griffith; they all deserve a huge thanks! Alanna Cecelia Jean MacNevin enjoys finding sounds and source materials that delight her and utilizing these materials to explore the process of making a variety of art. Reboot.fm is one of the founding members of the radia.fm network for the international syndication of independent radio art.